My friend Michael Shellenberger delivered a TEDxCalPoly talk: How Fear of Nuclear Ends. 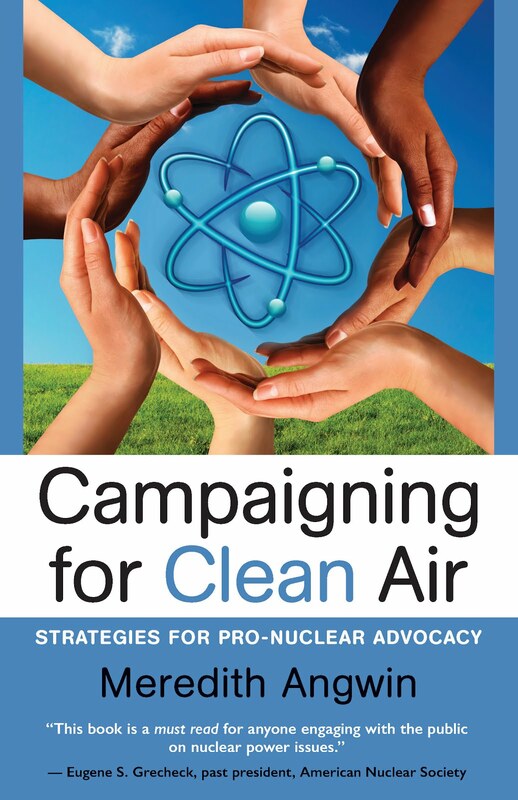 This is a terrific talk, tracing opinions on nuclear energy from the days when the Sierra Club policy "Atoms not Dams, (because of the huge ecological impact of hydro plants). Then he describes the controversy and confrontation within the Sierra Club as subgroups pushed against nuclear power. The quotes from the early anti-nuclear people are very telling: these people are basically against clean power because it would lead to population growth or economic growth or both. 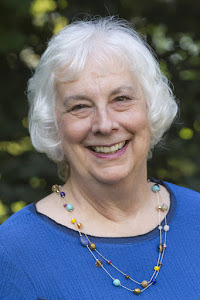 Shellenberger talks about how anti-nuclear fears were nurtured by a small group of people, and how anti-nuclear fears will end. One reason they will end is because everyone wants---a better world for our children. Happy New Year to everyone, and especially to readers of this blog! I plan some posts on nuclear power and grid policies. This post shows how instituting Pay for Performance does not help nuclear plants. The post is an expanded version of my article, Pay for Performance on the U.S. Grid, at Nuclear Engineering International, February 2016. I am grateful to Nuclear Engineering International for permission to use their graphics. 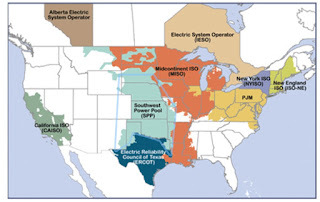 The United States electric system contains both traditional (vertically integrated) and “liberalized” markets. In the “liberalized” markets, RTOs (Regional Transmission Organizations) and ISOs (Independent System Operators) operate the grid, using free-market auctions. The RTO areas are the most challenging for the American nuclear fleet. All the nuclear power plants that are in danger of shutting for economic reasons are in RTO areas. Neither RTOs nor vertical integration are perfect systems for pricing electricity. RTOs are relatively new (started in the 1990s) and are still evolving their policies. In particular, some RTOs are planning to reward more-reliable plants by instituting “Pay for Performance,” starting in 2018. Unfortunately, despite the hopeful name, this change is not likely to help nuclear plants. The RTOs were designed to lower costs for consumers by giving them the benefit of free-market pricing: electricity is bought in an auction. When the ISO needs power, plants “bid in.” ISO chooses the lowest price power first, moving up the bids until all the power needs are met. 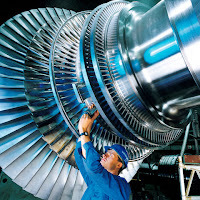 Power plants and utilities can also negotiate Power Purchase Agreements (PPAs) at mutually agreeable prices, and a great deal of electricity is sold in this manner. However, in many markets, investor-owned utilities are prohibited from entering into long term PPAs with conventional generation sources. At any event, PPA electricity prices tend to follow grid pricing, though sometimes with a major lag time. 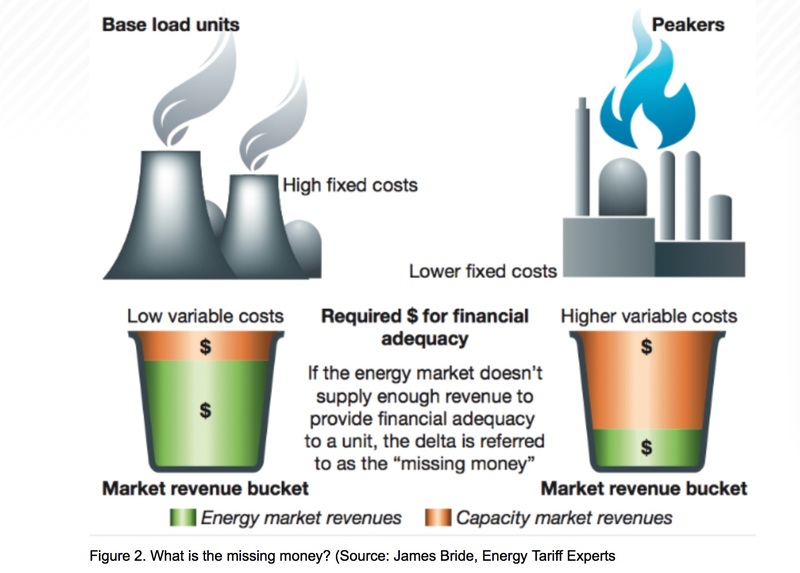 Unfortunately for the energy auction theory, the real-time energy auction plan immediately ran into the first “missing money” problem. Why should owners of higher-priced plants maintain their plants? Their plants are not guaranteed a price (while on the grid) nor are they guaranteed a number of hours that the grid is sure to call on them, and for which they will be paid. It became clear that paying only for energy (kWh) might not provide enough money to maintain all the plants that are needed for reliable grid operation. To pay plants to be available, plants now bid into a second auction, an availability auction called the Forward Capacity Auction. As you can see in the following chart (prepared from ISO-NE data by Entergy, and used with their permission), the Capacity Auction made it possible for gas turbines and peaking plants to make up enough money to keep operating. 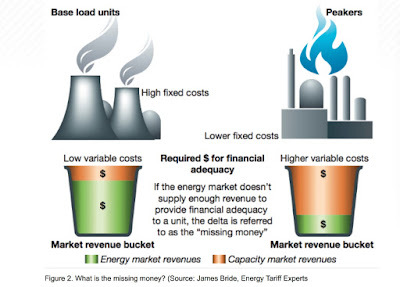 The capacity auction found the missing money for some of the plants. 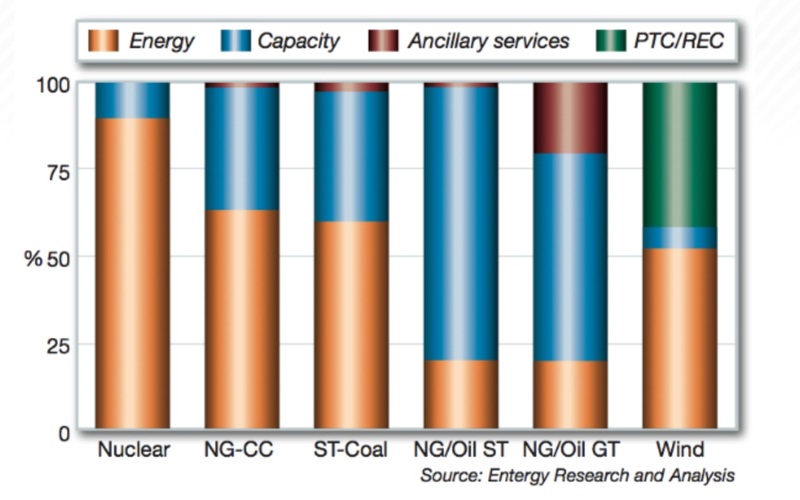 As you can also see, nuclear plants get most of their money from energy payments, not capacity payments. That is because nuclear plants make so many kWh, compared to other types of plants with the same nameplate capacity rating. 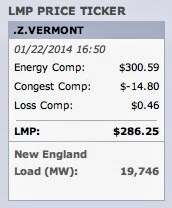 Ultimately, of course, the grid is all about kWh delivered. Capacity auctions did not completely solve the reliability problem. They find some missing money, for some types of plants. But what happens when the plant receives the capacity money, but then---later---when called upon to run by ISO, the plant doesn’t run? ISO-NE and other ISOs were aware of this potential problem, and began designing Pay for Performance incentives. These incentives were to start in 2018. However, meanwhile, the shale gas boom happened, and the grid became more and more dependent on natural gas. The ISOs needed something for winter reliability, something they could put in place more rapidly then Pay for Performance. In many ways, the capacity auction results misled ISO about the amount of electricity that would be available to the grid in crisis situations. During cold snaps, much less electricity was available than had been bid into the capacity auction. Natural gas power plants rarely have firm gas transportation contracts with pipelines. The gas plants made firm capacity commitments to the grid but did not have firm delivery commitments for natural gas supply. The Polar Vortex laid bare this problem. In winter, the ISOs needed a quicker winter fix than Pay For Performance, so they started “winter reliability programs.” These programs were started just in time. During cold snaps, gas plants not coming on-line was driving the grid closer to the situation where it would have to “shed load” in a cold snap. The Winter Reliability programs were complex, including new types of auctions. Basically, however, they supported plants to keep oil, CNG and LNG onsite to burn when gas was not available. ISO paid for oil, or paid storage costs for unburned oil. FERC (the Federal Energy Regulatory Commission) approved the Winter Reliability programs on a temporary basis. But FERC disapproved of the fact that the reliability programs were not fuel-neutral, and ISOs are supposed to be fuel-neutral. Therefore, FERC and ISO look forward to 2018, and PFP. Pay for Performance (PFP), which will start in 2018, is supposed to be fuel-neutral. PFP is supposed to find yet another kind of “missing money.” It is supposed to provide the economic incentive that would encourage power plants to come on-line when dispatched during tight situations on the grid. Sadly, PFP isn’t actually market-based. It is a complex regulatory system, basically jury-rigged, that satisfies FERC requirements by supposedly being fuel-neutral. PFP is a transfer mechanism from poor-performing plants to high-performing plants. If a plant bids in capacity, but then does not provide energy (electricity) when called upon, it will have to forgo part (or maybe all) of its capacity payment for that month. 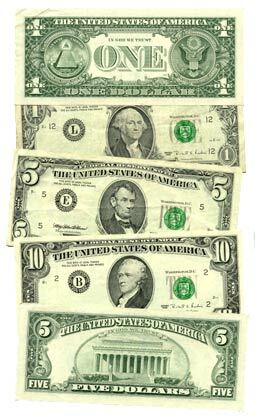 The loss of this money is a sort of penalty for the plant. This lost-money will be added to the capacity payments of plants that do perform during a high-load period, as a sort of bonus. Nuclear plants may get some extra payments from PFP, but these payments would be part of their capacity payments. For nuclear plants, capacity payments are a small portion of their revenue stream, and PFP will not make much of a difference to their pay stream. The major effect that PFP seems to have had is to encourage all new gas-fired plants to be dual-fired, so they can keep oil on-site and keep their capacity payments. With PFP, there’s a lot of devil in the details. One issue is that it does not distinguish between various types of plants, and could penalize plants that raise steam. PFP depends upon a complex formula which is the result of many debates on how to structure incentives for plants to be online. The amount of the penalty/transfer payment depends on this formula, and the formula partly depends on the situation on the grid. PI (PFP) creates excessive investment risk because.... PI’s substantial penalties would impact capacity suppliers that are not operating during particular five- minute intervals regardless of the reason why they were not operating. PI would ignore the actual operating characteristics of a power plant when levying penalties. Katz gives an example in which a steam power plant bids into the day-ahead market, is not selected for that market, but then it turns out that ISO-NE does need its power. Steam plants cannot come on-line very quickly, and ISO-NE PFP assesses penalties on a five-minute basis. The problem in this case is actually the result of ISO’s imperfect prediction capabilities, but the fines will be paid by the steam power plant. Well, PFP is messy, and PFP may be unfair. Let’s ask another important question, though. Will PFP help nuclear power? Will PFP finally reward nuclear plants for their reliability? The answer is No. PFP will not help nuclear plants. The main result of PFP has been for natural gas plants to commission or recommission dual fuel capabilities so that they can burn oil. 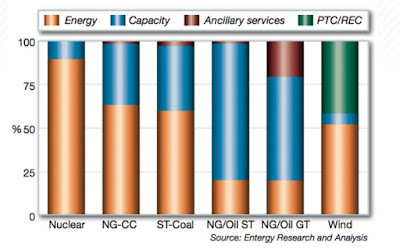 Nuclear plants get most of their revenue from energy payments, not capacity payments. Nuclear plants may get some higher capacity payments through pay-for-performance, but this will not make a big difference to them. The pay-for-performance transfer will make a difference to the peaker plants, which will have more of an incentive (however oddly arranged) to become dual-fuel or make other arrangements to be able to come on line when called. Are RTOs really a market? The whole RTO situation is getting pretty far from “a market,” as markets are usually considered. Nuclear power plants in RTO areas of the United States are not well valued for their steady performance and PFP will not change that. Meanwhile, the RTO market-solution is becoming an increasing series of tweaks and attempts to keep the grid operating smoothly. The tweaking in RTO areas (including PFP) is interesting and complex, and it becomes more complex all the time. Complex markets become complex as they are regulated to achieve certain goals. In general, RTO markets favor plants with low capital costs, high fuel costs and low utilization compared to plants with high capital costs, low fuel costs, and high utilization. This is the outcome of the current market design. In other words, RTO markets are unfavorable to nuclear power. Whether this outcome was a goal of the design (a feature) or an unintended consequence (a bug) is not clear. At any rate, despite all the tweaks, RTO markets allow local grids to move to heavily to natural gas, despite problems with gas delivery. Except for dual-fueled plants, Pay for Performance will make little difference. RTOs generally run two types of auctions: a real-time energy auction, and a Forward Capacity Market auction. Both auctions work basically the same way: Plants bid in to supply either kWh right now (energy auction) or capacity availability some years in the future (Forward Capacity Auction). The auction requirements fill from the bottom--the least-cost plants are selected first. In both auctions, plants usually bid the lowest price they can bid, to be sure they are chosen. The RTO has to fill its needs, however, so it cannot just choose a few low-price plants. At some point, with higher-priced plants, the RTO requirements are filled. In both auctions, all the bidders get the payment for the highest price plant that is accepted into the queue. The auctions are meant to move prices in synch with demand, and always provide the lowest price that meets the demand. Where do different plants get their revenue under this system? We imagine a 500 MW nuclear plant and a 500 MW combined cycle gas plant. They will both get the same capacity payment of $1,500,000 per month, because they have the same capacity. The nuclear plant has a 90% capacity factor, and earns approximately $13 million for energy payments. The combined cycle gas plant capacity factor is about half of that of the nuclear plant (around 40-50% capacity factor, according to EAI, I am assuming 45%), so it makes half the electricity as the nuclear plant. It earns approximately $6 million in energy payments. In this highly simplistic case, the capacity payment for the nuclear plant is about 10% of its revenue stream, but it is 20% of the revenue stream for the gas plant. If the gas plant were a “peaker,” running about 10% of the time, it would receive the same capacity payment as the other two plants. However, it would earn only $1.5 million in energy payments. 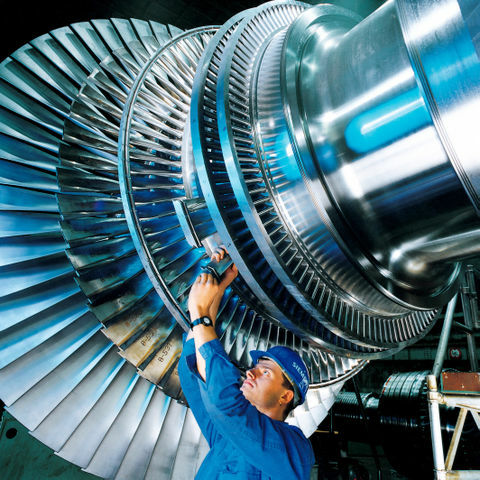 For a "peaker" plant, capacity payments could be about half of its revenue. One way in which this analysis is overly simplistic is that the gas-fired plants are likely to only be on the grid when the grid prices are running higher than average. Nevertheless, this gives a high-level overview of capacity and energy payments for various types of plants on the grid. For a nuclear plant, even a small decrease in energy prices can override a modest increase in capacity payments. This is the main reason why PFP will not affect nuclear economics very much.